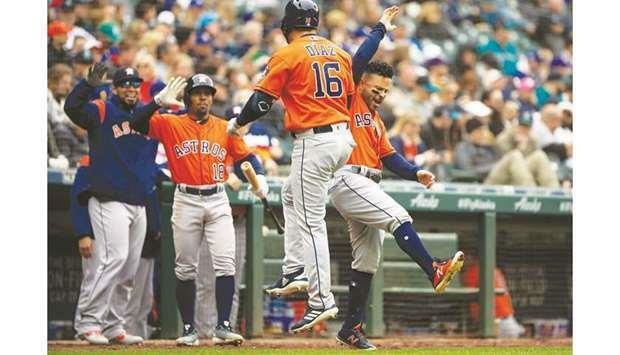 (MENAFN - Gulf Times) Aledmys Diaz led off the seventh inning with a home run to break a tie as the Houston Astros rallied to defeat the host Seattle Mariners 3-2 on Sunday afternoon, extending their winning streak to nine games. Seattle's Mitch Haniger led off the bottom of the first with a home run off Cole, hitting a 1-2 pitch into the bullpen in left field. That gave the Mariners homers in each of their first 18 games to begin the season, extending their major league record. The Mariners made it 2-0 in the third as Haniger and Domingo Santana hit back-to-back doubles with two-outs. Mariners left-hander Marco Gonzales, who gave up just one hit and kept Houston off the scoreboard through the first five innings, ran into trouble in the sixth. Tony Kemp led off with a single to centre field and advanced to second on a one-out single by Altuve. Alex Bregman then singled to right to load the bases. Michael Brantley then grounded a two-run single to right field to tie the score and end Gonzales' afternoon. Right-hander Brandon Brennan struck out Carlos Correa and Yuli Gurriel to end the inning. Gonzales, who had won each of his first four starts of the season, went 5 1/3 innings and surrendered two runs on five hits, with two walks and three strikeouts. Brennan, who was selected in the Rule 5 draft in the offseason, opened the season with eight scoreless appearances before Diaz lined the first pitch of the seventh over the left-field wall to give the Astros a 3-2 lead. Houston right-handers Hector Rondon, Ryan Pressly and Roberto Osuna combined for three hitless innings of relief, with Osuna earning his seventh save of the season. Guillermo Heredia capped a five-run eighth inning with a two-run, pinch-hit home run to help the visiting Tampa Bay Rays defeat the Toronto Blue Jays 8-4 on Sunday afternoon. Mike Zunino added a two-run, pinch-hit single in the eighth as the Rays took two of three games in the series and have now won six of their last seven games, all on the road. Freddy Galvis and Billy McKinney homered for Toronto, McKinney also adding two doubles. Rays starter Charlie Morton gave up four hits, three walks and one run over 4 2/3 innings. He struck out four. Adam Kolarek (1-0) pitched one perfect inning to pick up the win. Blue Jays starter Marcus Stroman (0-3) surrendered three hits, four walks and three unearned runs while striking out five in four innings. The Blue Jays scored once in the first when leadoff batter McKinney doubled and Galvis singled him home.The Rays answered with an unearned run in the third. Michael Perez singled, Blue Jays second baseman Lourdes Gurriel Jr. threw errantly on Ji-Man Choi's two-out grounder, Avisail Garcia walked and Brandon Lowe hit an RBI single. Gurriel was replaced at second base by Alen Hanson in the fourth, but the Rays scored two unearned runs in that inning. Kevin Kiermaier reached second base on Stroman's throwing error after a bunt. Willy Adames followed with an infield single, Perez walked, and Austin Meadows and Yandy Diaz each produced RBI groundouts.